Recent refreshes to Blancpain’s Fifty Fathoms lineup has kept the longstanding dive watch collection in the spotlight recently; however this is anything but new. Given its rich diving history as one of the very first dive watches ever created, there will always be a place for anything dubbed “Fifty Fathoms” in the marketplace, even when it features a complication not usually connected with diving. With that in mind, I’m not talking about the new Bathyscaphe complete calendar that launched last year either. I’m going back into the archives for a closer first-hand look at one of the earlier oddities from the brand – the Blancpain Fifty Fathoms Flyback Chronograph. Launched back in 2007, this particular model (reference number 5085F-1130-52 in case you’re wondering) is still a part of the brand’s current offerings some 12 years later. While it’s definitely a bit of a niche watch, I thought I’d take Blancpain up on the opportunity to take a closer look about what this piece is all about. 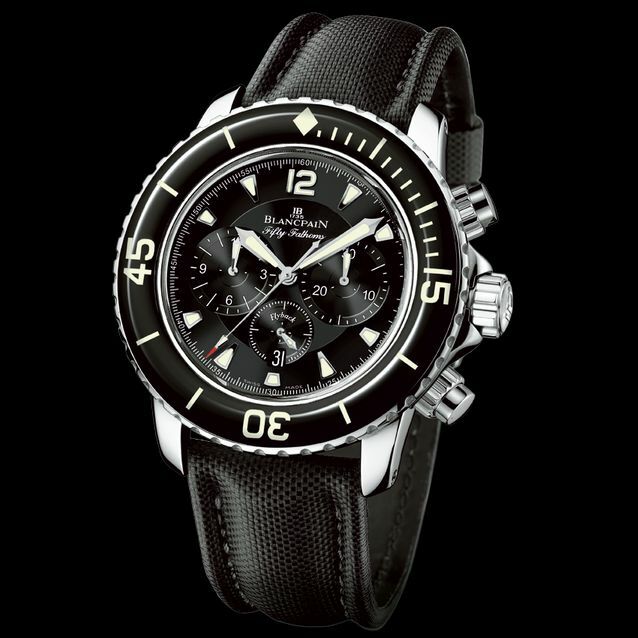 Originally introduced in 2007, the Blancpain Fifty Fathoms Flyback Chronograph is still a part of the brand’s current catalog (Image: Blancpain). As with most non-Bathyscaphe Fifty Fathoms models, the first thing that catches the eye when looking at the Fifty Fathoms Flyback Chronograph is its prominent sapphire bezel. Its bright luminous glow can be spotted from across the room in the right conditions, and its inherently reflective nature quickly purges any thought of being “under the radar” despite its plain black color. From there, you’ll note its chronograph sub-dials at 3 and 9 are oversized compared to standard chronograph registers, which is a nice bonus that improves legibility. They do dwarf its running seconds sub-dial at 6, though not to the point of making the design seem awkward. In sticking with this somewhat reflective theme, its case is high-polished throughout, and tapers slightly inwards from its dial side towards its caseback – just one of a couple of details that help to give it a slightly reduced feel when on the wrist. 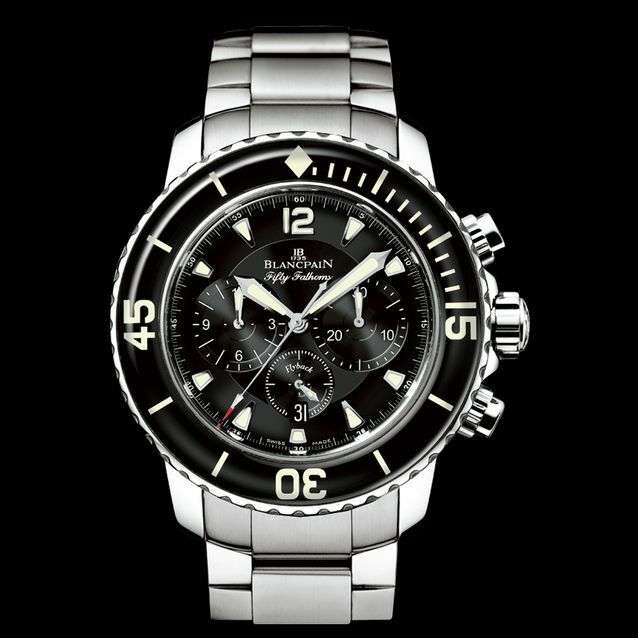 Blancpain claims that the chronograph pushers can be safely operated while underwater (Image: Blancpain). Being a fairly high-level piece when it comes to steel sports watches, this isn’t just your average off-the-shelf chronograph. The Blancpain self-winding caliber F185 is an integrated column-wheel chronograph with flyback functionality, allowing for instantaneous resetting of the chronograph rather than having to stop, reset, and start again. The movement is comprised of 305 parts, uses a silicon balance spring, and is good for a reasonable (but not exceptional) 40hr power reserve. It also features an instantaneous jumping date indication tucked into the running seconds sub-dial. On a functional level it’s worth noting that the watch is rated for 300m of water resistance, which is to be expected with it being part of their iconic dive watch collection. What does come as a bit of a surprise though is the design of its pushers. At first glance, the knurled bases of the pushers would lead one to believe that they were the screw-down variety – a feature that would assist in achieving its water resistance. Not so – that detail is purely aesthetic, yet the brand claims that the chronograph can be safely operated under water (personally I still wouldn’t risk it). 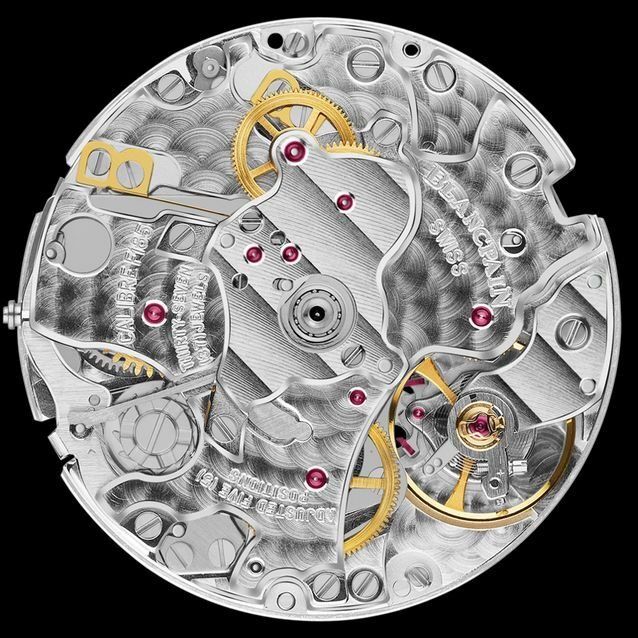 The Blancpain Caliber F185 is an integrated column-wheel chronograph with flyback functionality (Image: Blancpain). A 45mm diver inherently comes across as something that will be rather hefty on wrist; however the Fifty Fathoms Flyback Chronograph genuinely feels a fair bit less hefty than I had expected. The combination of its short lugs and tapered case help the watch hug even a more slight wrist like my own (6.75”), all while shaving down its overall mass. That said, what completely sealed the deal for me was its sailcloth/canvas strap. This is hands-down one of the most comfortable OEM straps I’ve thrown on in quite a while. Usually when I’m trialling a piece, I go out of my way to swap it onto a different strap combo as an exercise in versatility; however in the case of this guy, I wasn’t bothered to leave it on the stock option. That said, a swap is more difficult on the Fifty Fathoms Flyback Chrono than most other divers, as Blancpain uses proprietary screws to secure its bars. A minor gripe considering you’ll get the tool when purchasing the watch, but if you’re a frequent strap changer, be prepared for a little additional work. The included sailcloth/canvas strap that comes with the Fifty Fathoms Flyback Chronograph is remarkably comfortable (Image: Blancpain). Overall, I’ve gotta say that I was mostly taken with this diver chronograph, even though at a fundamental level, the piece is a bit confusing. 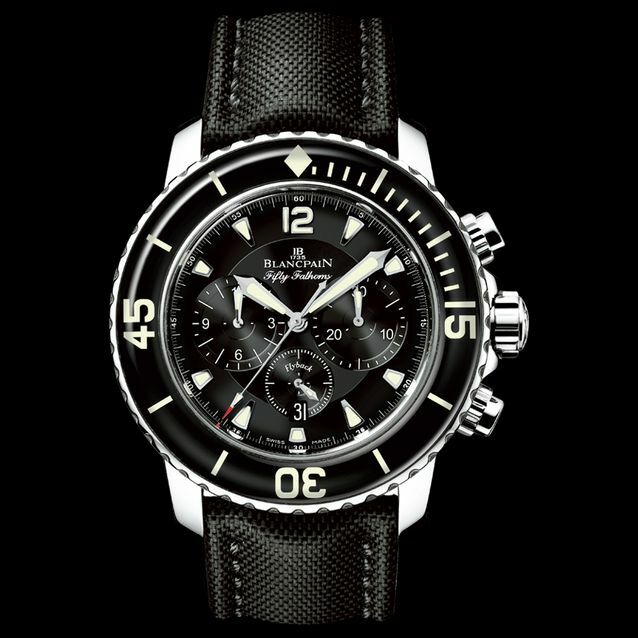 Given the heritage of the Fifty Fathoms line, I’d have more respect for Blancpain had they chosen to stick strictly to divers instead of diversifying their dive watch collection in the way that they have; however then again, we’re talking about a member of the Swatch group who are notorious for mass volumes of SKUs throughout their brands. They saw a demand for more, and rather than limiting supply and playing the game the way Rolex and AP have, they delivered, and delivered, and delivered again. It’s big, it’s a little weird, it’s a little flashy, but I dig it.